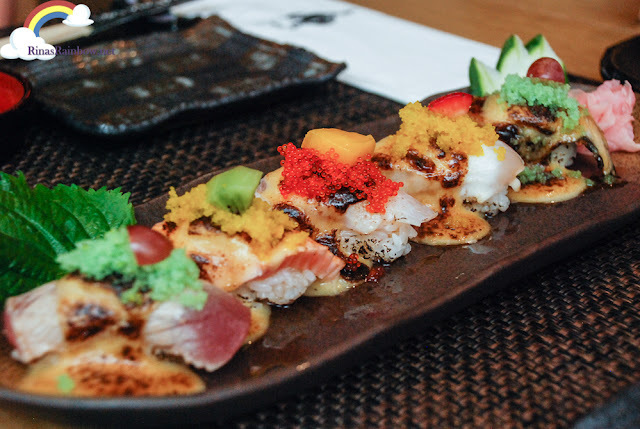 Rina's Rainbow: Beautiful and Delicious Authentic Japanese Dishes at Minami Saki by Astoria! 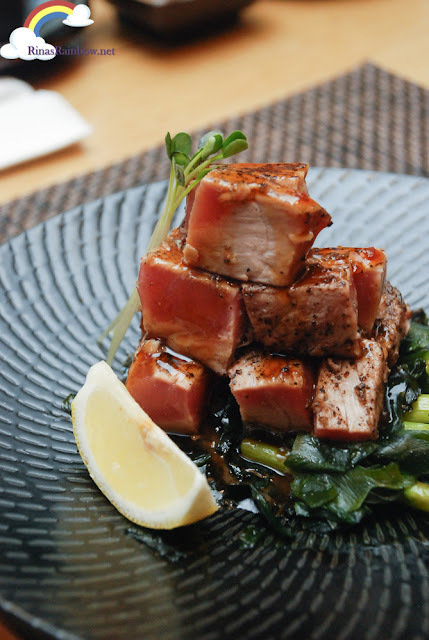 Beautiful and Delicious Authentic Japanese Dishes at Minami Saki by Astoria! 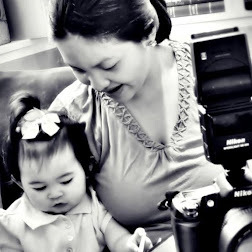 Whenever someone asks me what my favorite cuisine is, aside from Filipino, often my top answer is Japanese. 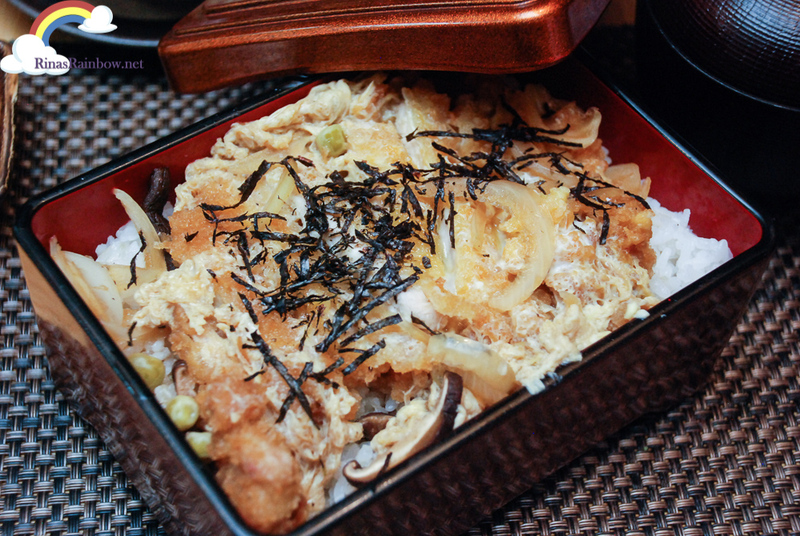 I just can't say no to a good tempura, or a katsudon! I love the mixture of sweet and salty that Japanese food usually has. And so a few weeks ago I was thrilled to have tried another good Japanese restaurant! So authentic that the Executive Chef creates these beautiful dishes unlike anything I've seen before. And the place is Minamisaki by Astoria. And they have nice booths for a more intimate set up. Now, behold his beautiful and delicious creations! At first glance, it's hard to tell what this dish actually is. 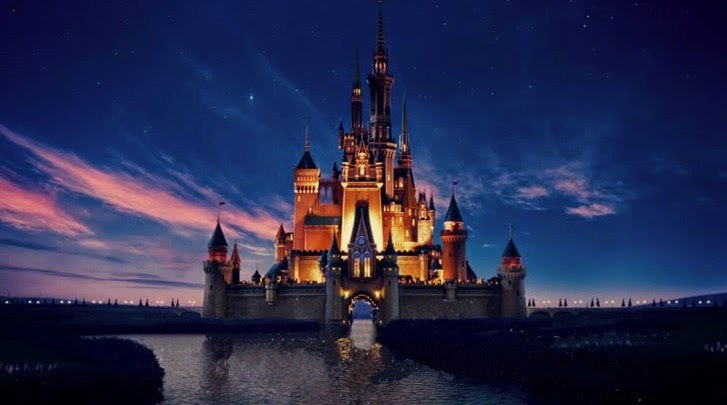 But it's hard to care because it looks beautiful! 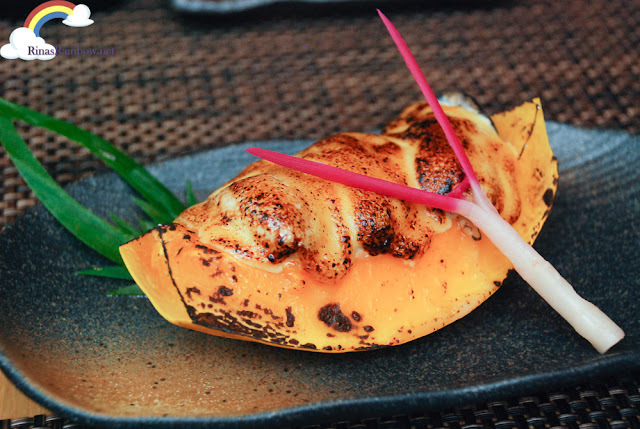 This is Chef's signature Kaki Papaya Yaki (P580). It's boat of papaya, and sitting on it are roasted Japanese oysters with miso sauce, and then topped with fresh ginger blossom for presentation. And yes, it's delicious! If you like oysters you should definitely add this on your list of must-try. 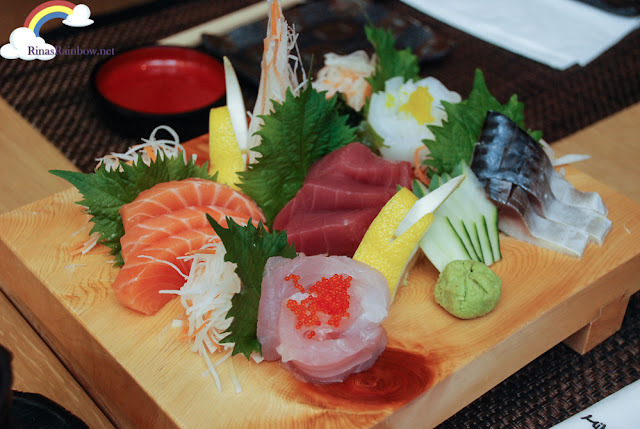 For sashimi lovers, you will appreciate this fresh board of Moriawase Take Sashimi (P800). 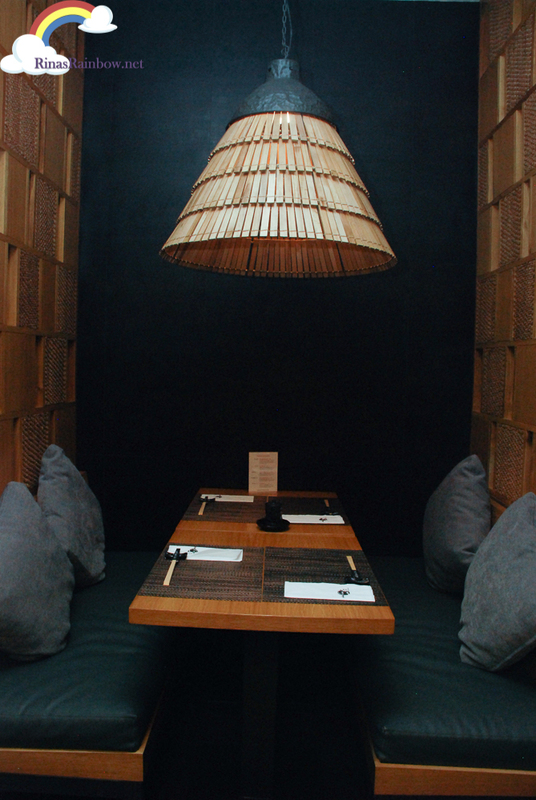 It's got five types of sashimi that you can happily indulge in while waiting for your main entrees. I didn't use to like sushi growing up. But I guess when you get older you start appreciating raw stuff. Personally I always go for the salmon! Another unique (at least unique to me) dish created by Chef Kimito is the US Scallops with Tamago Sauce (P720), I love scallops, and Chef Kimito made me love this even more by adding this delicious creamy egg sauce. (If you know me, you'd know that egg is another one of my magic words). Drooling right now. Chef Kimito just kept bringing out impressive dishes as our lunch commenced. This Aburi Sushi Five Kinds (P850) tasted as beautiful as it looked. 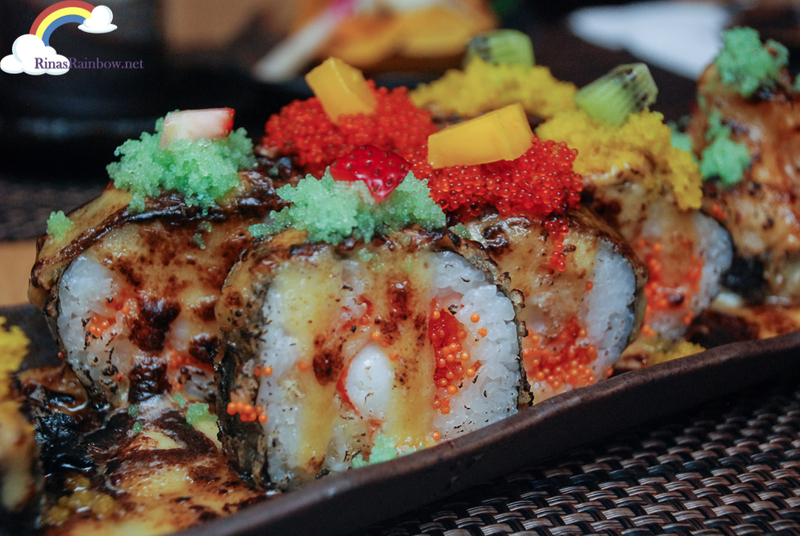 Obviously this is not your usual sushi. 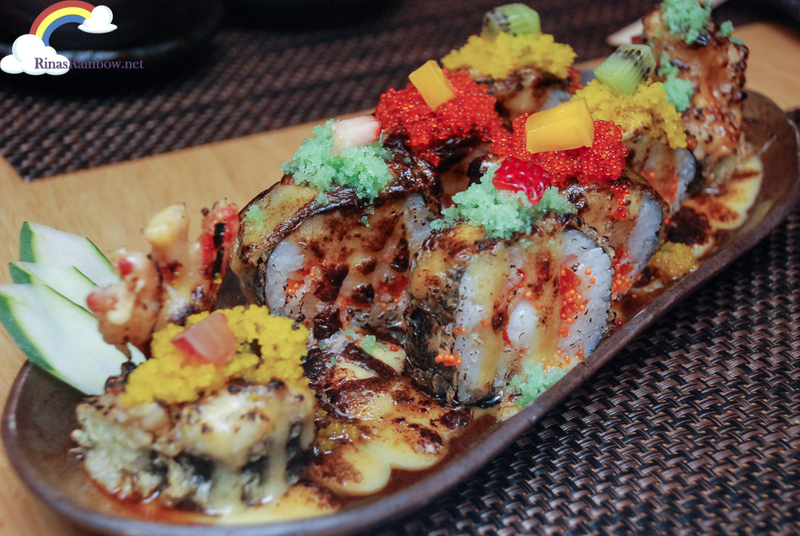 They're chef's signature torched sushi. Torched is the magic word for me! The sushi tuna, eel, salmon, lapu-lapu, and hamachi are all slightly torched, creating another layer of crunchy texture to it. 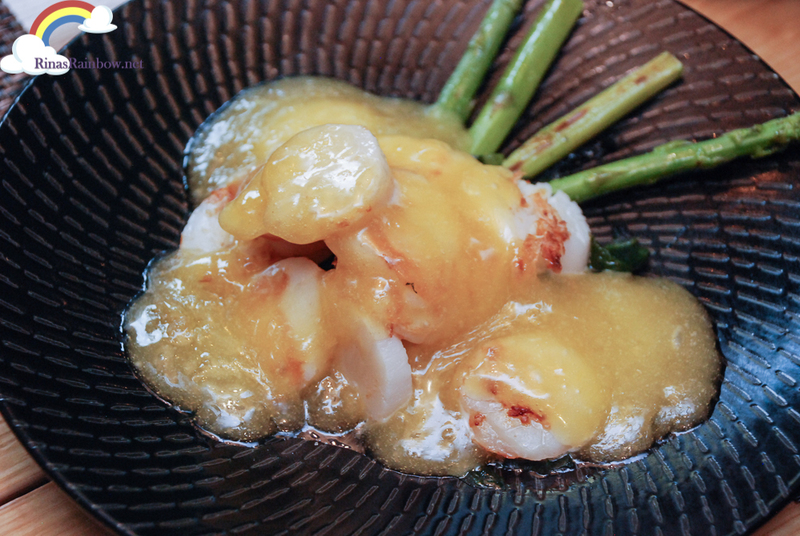 And then of course, smothered in his special creamy aburi sauce. Oh my the sauce! One of the highlights of my lunch was the Tempura Maki (P550). These are huge rolls of makis stuffed with crunchy tempura, smothered again in his special sauce, and slightly torched. You definitely cannot eat this in one bite. It can get messy, which makes it even more fun to devour. I really enjoyed the taste and the texture. I would gladly order one plate all to myself. 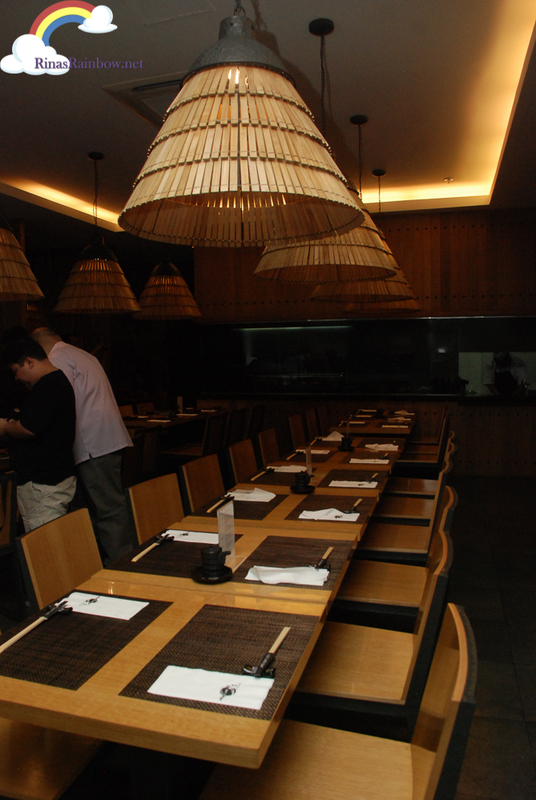 To prepare our tummies for the main entrees, we had the Dobin Mushi (P270). 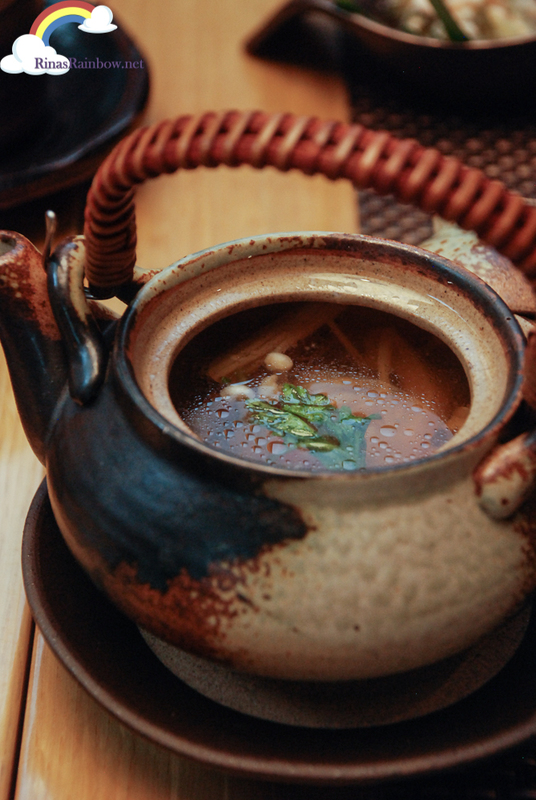 A light broth soup served in a tea pot, filled with fresh mushrooms inside. A perfect way to "stretch" the tummy to make room for the more heavy stuff. (If that makes sense). One of the reasons why I love Japanese food is the rice bowls. When I'm really hungry, I know I can always count on Japanese rice bowls because it's no secret that I love rice, much more so when the fluffy Japanese rice has Japanese sauce is poured over it. In Minami Saki, they have a rice 'box' that we got to try. The Katsuju (P480) is a deep-fried crumb clad cutlet bathed in egg, laying on a bed of Japanese rice, sprinkled with nori strips. 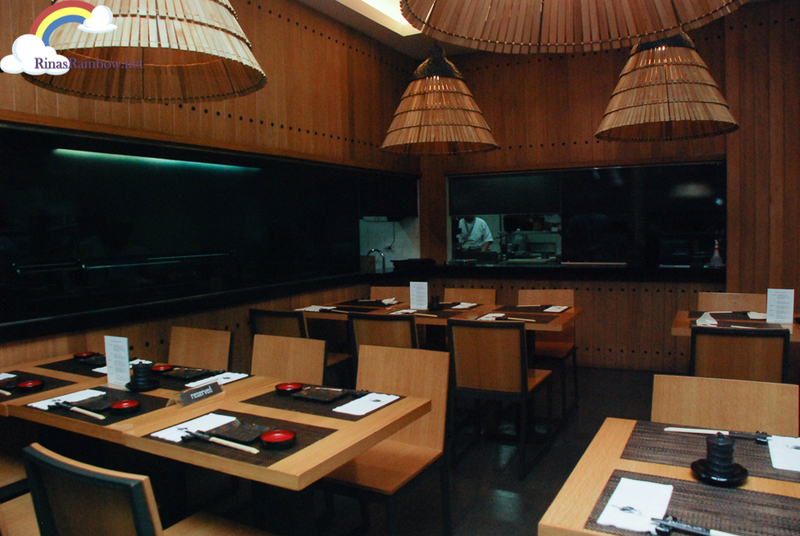 The Katsuju in Minami Saki is a set served with with a side of miso soup and fruits. Enough Japanese lessons. Moving on to the next masterpiece, the Maguro Pepper Steak (P550). Grilled chunks of fresh tuna steak, grilled to perfection as you can see with its pink center, stacked on top of a bed of wakame or seaweed. It's a good mix of flavors. The smokiness from the grilling, a hint of heat from the pepper, and a bit of tangy from the lemon. 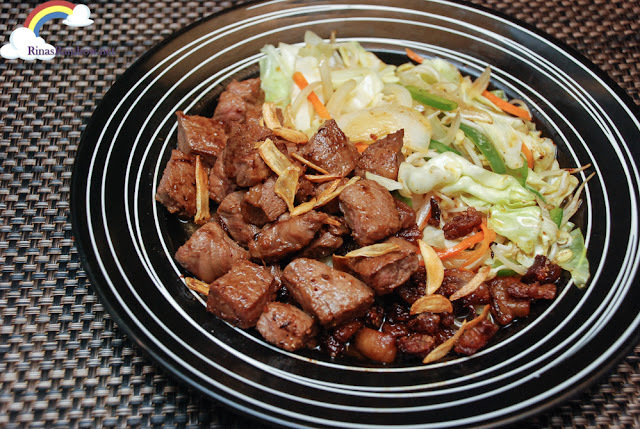 Another one of the group's favorite is the Usuyaki Steak with Mushrooms. 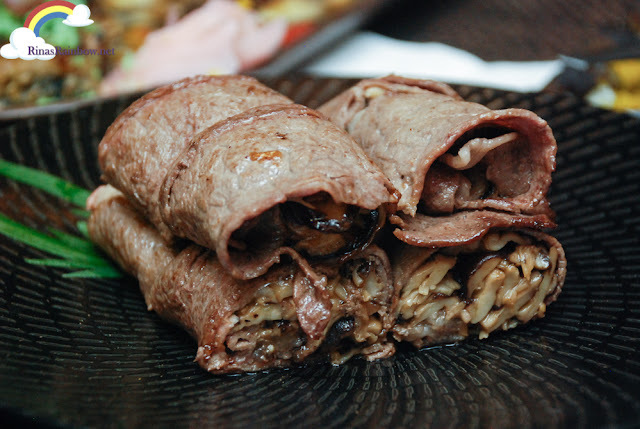 It is simply a dish of loads of mushrooms rolled inside a thin slice of tender steak. Juicy! And then, under the Teppanyaki choices, there's the US Angus Sirloin (P1,050). Truly there's nothing like the basic flavors of US Angus sirloin, fried with garlic, a bit of salt and pepper, and the Angus' natural oozing flavor, fried with mixed vegetables. Can't beat that! Usually I don't like the selection of Japanese desserts because there's hardly anything with chocolate haha! But Minami Saki has some delicious dessert selections that hit the spot. 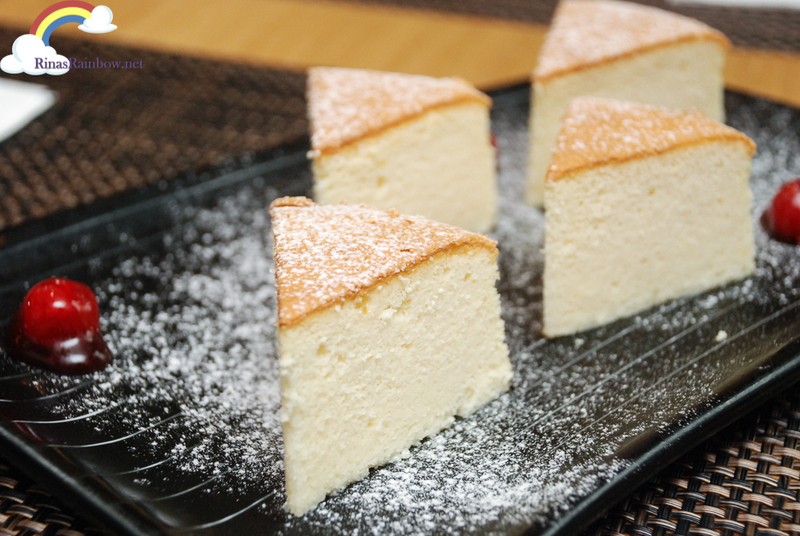 Here's the Japanese Cheesecake (P160). Fluffy and light as air with just a hint of sweetness. Very good! 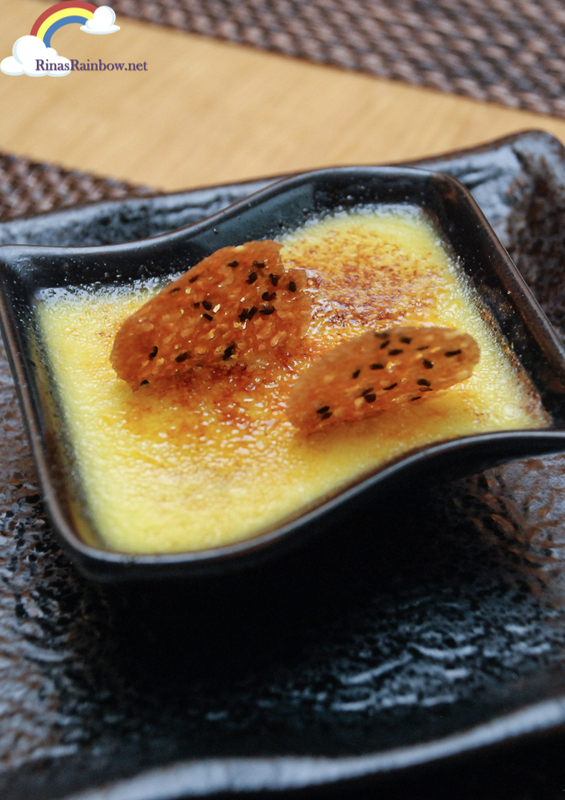 We also had the Wasabi Creme Brulee (P120), which is another first for me. The light but creamy vanilla custard is is glazed with wasabu caramel sugar, giving a hint of both sweet and wasabi flavor. Really interesting! And to top off the whole experience, the mesmerizing Coffee Jelly (P180)! The presentation got us all mesmerized. 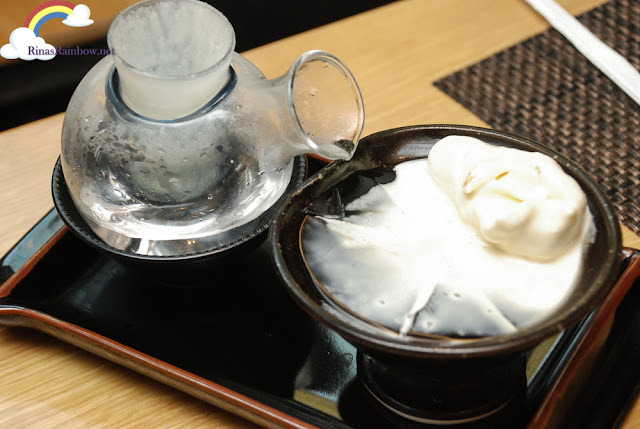 I think that's dry ice flowing out of the fancy beaker-like container, keeping the vanilla ice cream on top from melting too fast, and flowing into the coffee jelly. 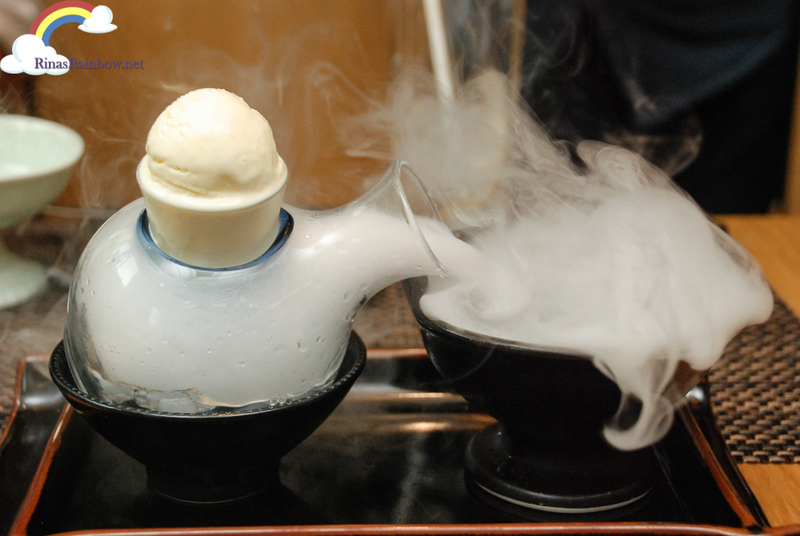 After the dry ice show, you can put the vanilla ice cream on top of the coffee jelly bowl and eat away! 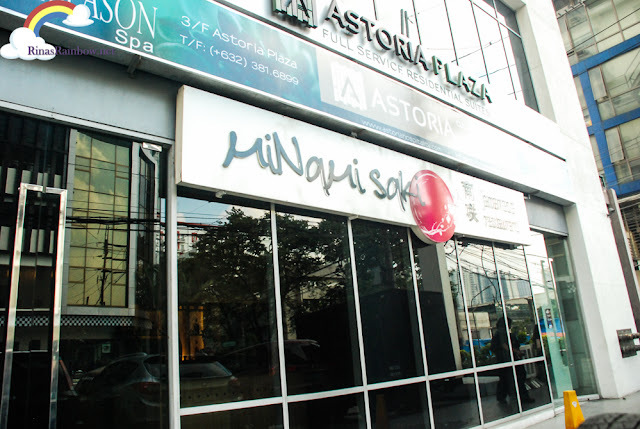 So next time you feel like dining in an Authentic Japanese restaurant, you should really try Minami Saki in Astoria Plaza. (And maybe save some Tempura Maki for me bwahahaha!) 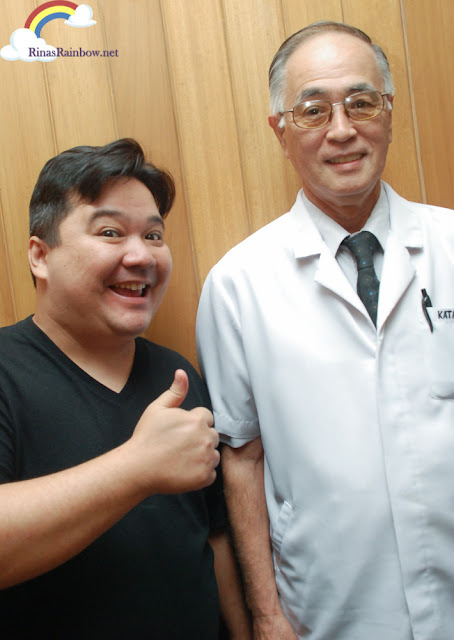 Executive Chef Kimito Katagiri to me is really a rockstar of the Japanese cuisine! However, there are specific many other things needed for costing old together with rolex replica Datejust present-day pieces, that is found in near future article content. 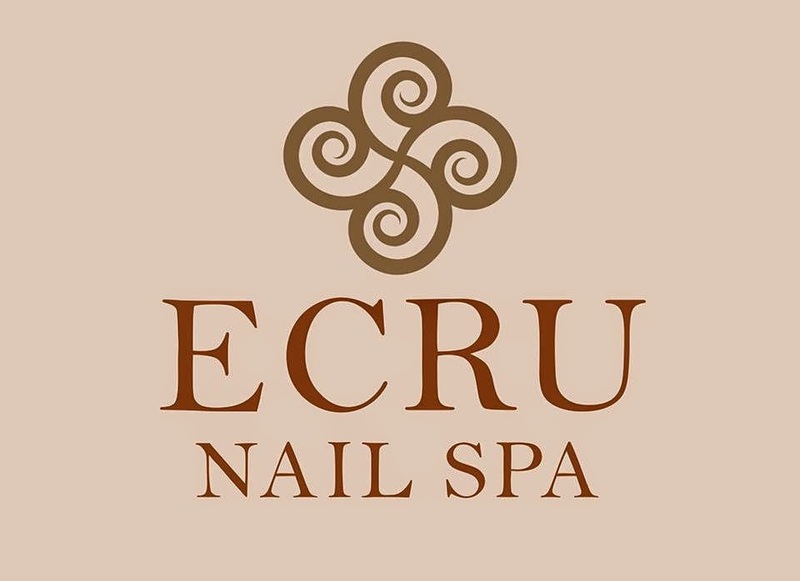 Typically, the true valuation associated with a see stands out as the expense that your particular extractor or simply person, whose hublot replica uk dream is any wrist watch and features the funds, likely pay one other extractor or simply car dealer, what person is familiar with on line casinos. Mention Bamford Watch Department and you will get mixed looks from hublot replica sale watch lovers. Understandably, there are those who think that customizing a replica watches uk is almost sacrilegious. On the other hand, there are those who defend Bamford and insist that replica watches they provide a cool option for watch lovers who love cartier replica watches but want something a little different, for a variety of reasons.